Chain-drive garage door openers are the "original" garage door openers. For most Americans, automatic openers are standard features for garage doors. But just a few decades ago, chain drive openers were the most exciting innovation in the garage door world. The reasons are clear and obvious: Automatic openers make life much more convenient. Not only are today's openers more convenient, but they are safer too, decreasing the number of injury-related accidents and tragedies involving garage doors. Genie Pro Max: Rugged full-chain drive and solid steel T-rail for long-lasting performance. Contemporary contoured design, reliable performance with fully enclosed, permanently lubricated gear housing for longer life. Lifetime limited warranty, 5-year parts warranty. Adaptable rails for up to 12' doors. Read a review of Genie Pro Max. Genie manufactures additional chain-drive openers. Visit geniecompany.com for more info. 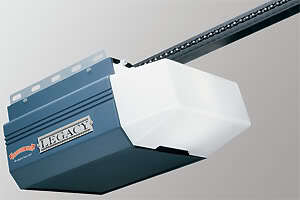 LiftMaster 3245: HP Chain Drive Garage Door Opener. According to LiftMaster, "Reliability with enhanced style is what you'll get with the LiftMaster 3245 1/3 HP Chain Drive Garage Door Opener. Its durable 1/3 HP motor combined with an industrial-strength chain drive provide smooth, steady performance year after year. Part of the Contractor Series, it is the choice for value and reliability." Visit liftmaster.com to view additional chain-drive models. Raynor Pilot Chain Drive: This opener provides durable, long-lasting performance and features advanced electronics and a powerful ½ horsepower motor. It also has advanced safety and security features. View complete specifications and additional chain drive models at raynor.com. Overhead Door Legacy Opener: Rugged full-chain drive and solid steel T-rail, fully enclosed chain with permanently lubricated gear housing. Contemporary contoured design. Learn more at overheaddoor.com.